It’s hard to believe there’s anyone anywhere who’s more excited about Supernatural Season 10 than me. But this past weekend at DallasCon I found lots of fans who could match me for hyper-ventilating, anticipatory squeeing, hand-wringing, bouncing excitement – and I have to admit, Jensen Ackles might give me a run for my money too. Which, needless to say, just made me MORE excited! I’ve been struck with Jensen’s palpable enthusiasm for playing DemonDean for a while, but he seems to be equally excited about the rest of the season and Dean’s arc too. 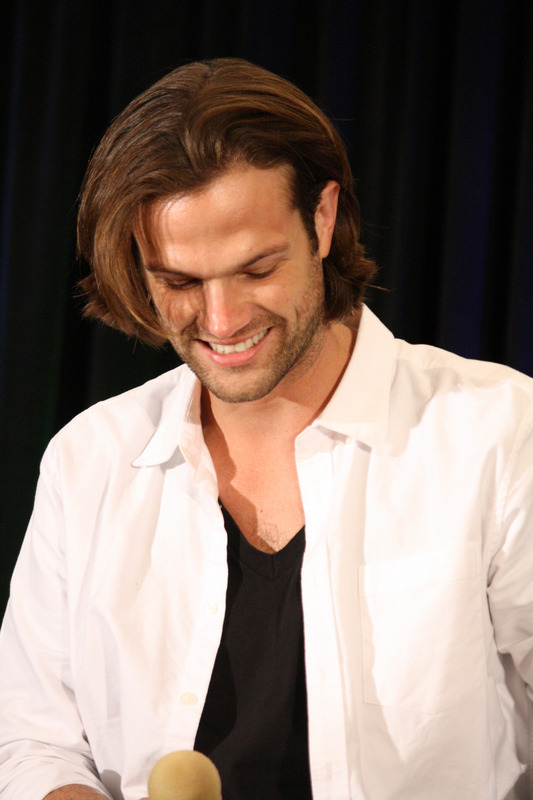 His energy – and Jared’s – has been so positive since last season ended, and especially since filming has begun. They’re both clearly enjoying using Twitter to put fandom into paroxysms of glee as they tweet photos during the Show’s 200th episode of Sam and Dean “where they belong” or of the two of them hanging out while we all celebrated the Show’s tenth anniversary. Season 10 seems to be agreeing with them both. 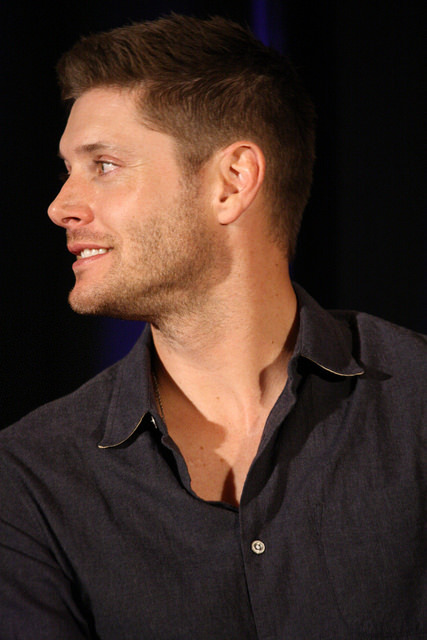 I shared my observations with Jensen at DallasCon. Lynn: This is sort of extraordinary for a Show in its tenth season, but it almost seems to me like you’re more excited for this season than you’ve been for quite a few others. Is that true, and if it is, why do you think that is? 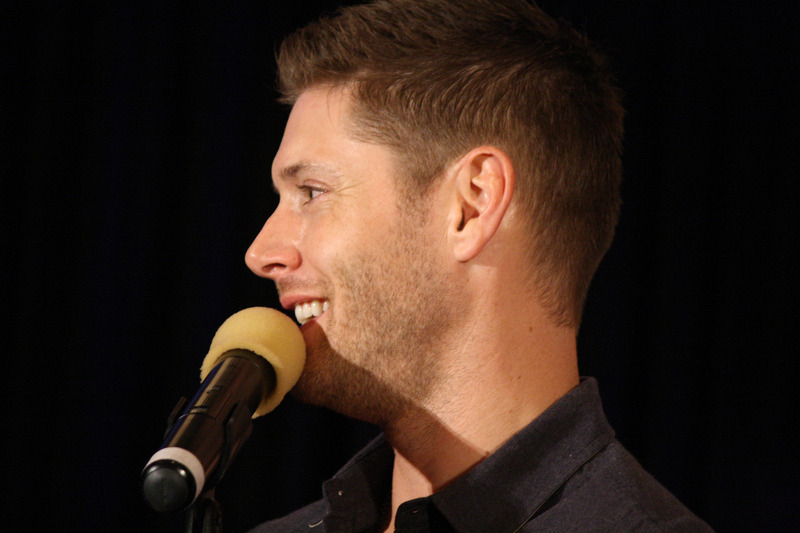 Jensen smiled and agreed that yes, it is true – partly because Season 9 was so difficult. That season, and Dean’s arc especially, was so dark that it really took a toll. He was working twelve hour days in that very dark place, and then he’d go home and be all alone, and it was really difficult. Not that he wanted to say that he was depressed, but it was hard. Jensen said he realized that he could have asked Danneel to come up with JJ, and she would have done that, of course. Lynn: You do remember you’re talking to a psychologist, right? Luckily, I don’t think Jensen needs an intervention. He was practically glowing as he talked about the new season. And now that his weekends are spent in Austin with his family (and Jared and his family right around the corner), “Lonely Jensen” is just a brilliant pair of tweets from Jensen and Jared. Oh, and an internet meme gone viral. Anyway, back to Demon Dean. Jensen also talked in his meet and greet [snippets only, this is not a transcript – just my memory of a few interesting moments] about his choices in playing Demon Dean. He said he didn’t want to sort of take the easy way out and play him totally dark, so instead played him as just not caring – because really, what’s scarier than someone who just does not care? As he often does, Jensen was following the advice of Kim Manners, who clearly shaped the way Jensen acts, directs and lives his life in a profound way. Kim would say ‘give them what they expect in a way they never expected,’ and that’s what he tried to do with Demon Dean. A fan asked what his favorite scene as Demon Dean was. Jensen said it was the one with Jared, when Sam finally confronts Dean. We (the audience) is expecting Sam to be able to draw out Dean’s love for his brother, and it’s really hard on Sam as he tries to do that – and Dean is enjoying watching his brother go through that. Talk about chilling. I have a feeling that Jared and Jensen played the hell out of that scene, which will probably be so intense I’ll need CPR by the time it’s over. Somebody be standing by, please? When Dean goes from being a demon to being a man with a problematic mark again (whenever that might be…no spoilers! 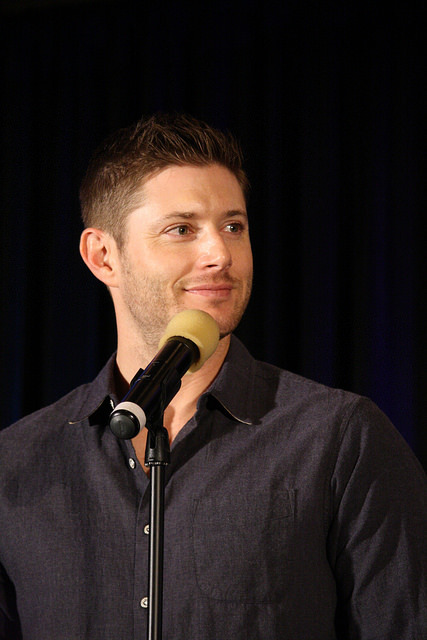 ), Jensen is excited about that version of his character too. It sounds like Season 10 has the brothers eventually getting back to where they were, which will allow Dean to be Dean – with some of his trademark humor. 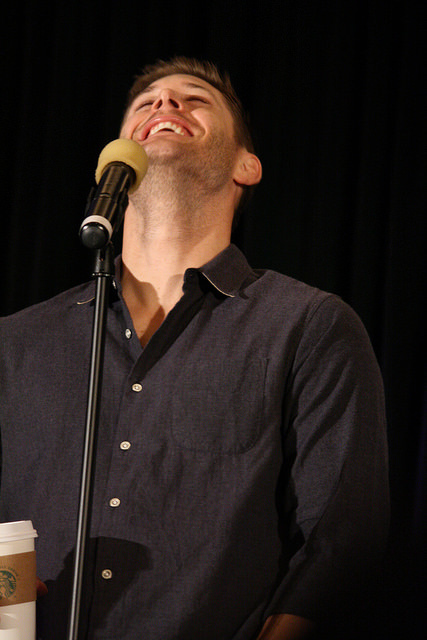 Jensen is excited about that too. Lynn: (perhaps bouncing a bit on her chair) OMG me too! About all of that!! Have I mentioned I’m excited about Season 10?? Jensen telling the story of the gigantic centipede that somehow made its way into the Padalecki house. Poor Gen freaked out (I would have run away and never come back…) – and since the Supernatural cast takes the term “SPN Family” literally, who did Gen call to come help? Danneel, of course – who should have said, what? No way! Call 911! Turns out pest control doesn’t do “insects”, though Jensen rightly pointed out that this thing was big enough to belong in a zoo. Gotta say, that story and Jensen’s vivid description of the monstrous centipede were enough to give me nightmares. Ewww. There was another question about My Bloody Valentine, which originally had a different scripted ending where Jensen’s character, Tom, dies. 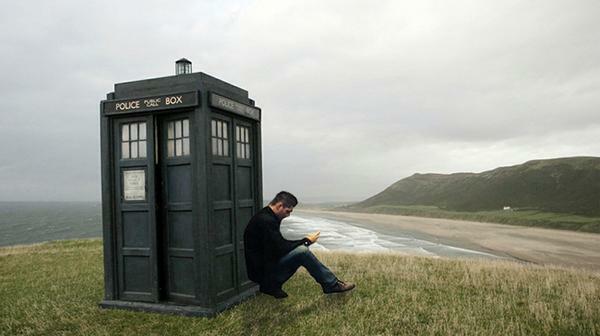 They shot the alternate ending too, and that’s the one they kept – which I loved. Jensen said that Phil Sgriccia likes to do that on Supernatural too. Sometimes after they’ve shot a take, he’ll say “Jensen, do something different this time,” and Jensen will just be like, okay, and go for it. It doesn’t work so well with guest actors, who of course don’t realize that the Supernatural set is a bit different than most others. Phil to guest actor: Okay, do something different this time. Guest actor: (looking petrified) Um, like what??! I love our Show, have I mentioned? Perhaps the most amusing moment was when Jensen talked about Jared’s son Tom and his daughter JJ playing together. Tom likes to dance to a little Elvis (“Hound Dog”) and the other day he pulled JJ in to dance with him. Which apparently consists of JJ standing still and waving her arms from front to back repeatedly – Jensen helpfully demonstrated. If JJ looks anywhere near as adorable as her daddy while ‘dancing’, it might be hazardous to watch. 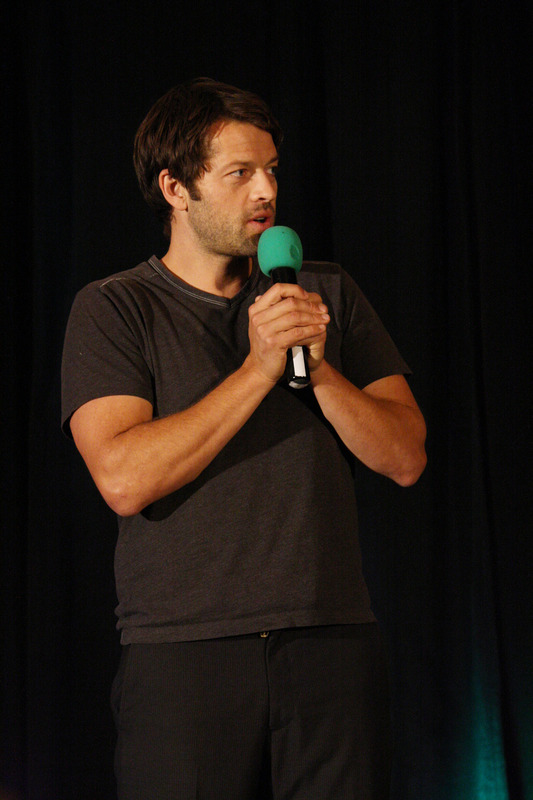 I had an amazing time at DallasCon. I got to hang out with so many fellow SPN fans from all over the country and the world, including some who have become cherished friends. I also got the chance to meet the Dallas Women of Letters (and have a delicious meal too) – we were privileged to donate a signed copy of Fangasm: Supernatural Fangirls for their auction for Team Levi — and to chat with fellow fan S.E. Hinton about the two shows we have in common, Supernatural and the upcoming Wayward Pines. 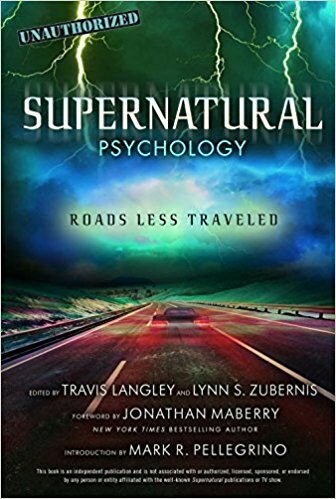 And thanks to everyone who came by to tell me how much they enjoyed our Supernatural books – that means so much! 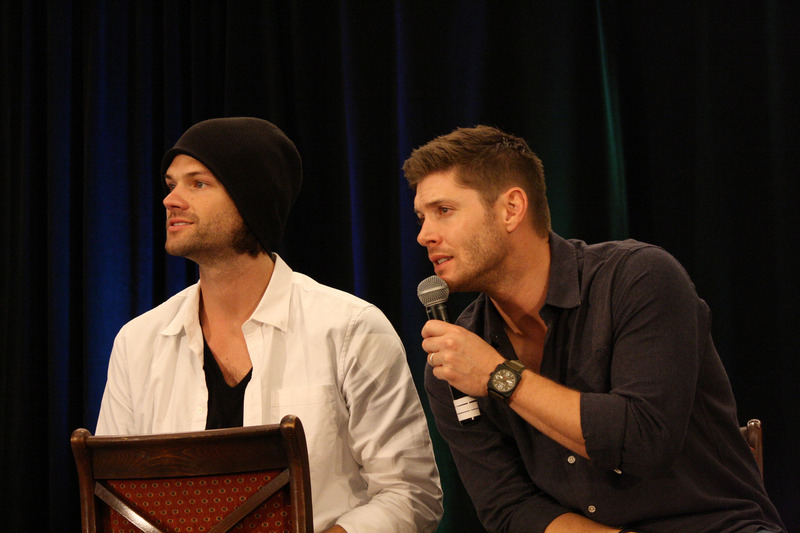 There’s much much more from DallasCon to come, with exclusive interviews and more con coverage. And some pretty pictures. Including these two gorgeous guys. Links at the top of the page! I follow you on Twitter but just found your website. Fantastic articles! Looking forward even more to ordering your books now. I’m very excited about Demon Dean! 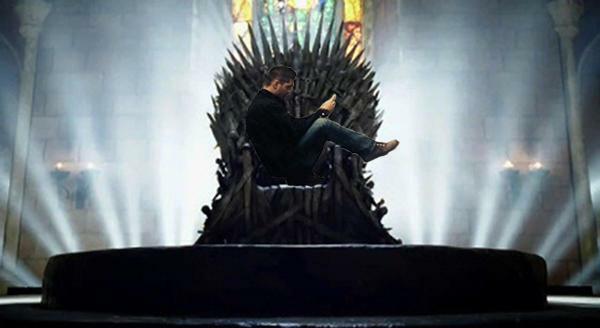 Jensen Ackles is an amazing actor and has blow me away so many times, but I have a feeling this will reach new highs! 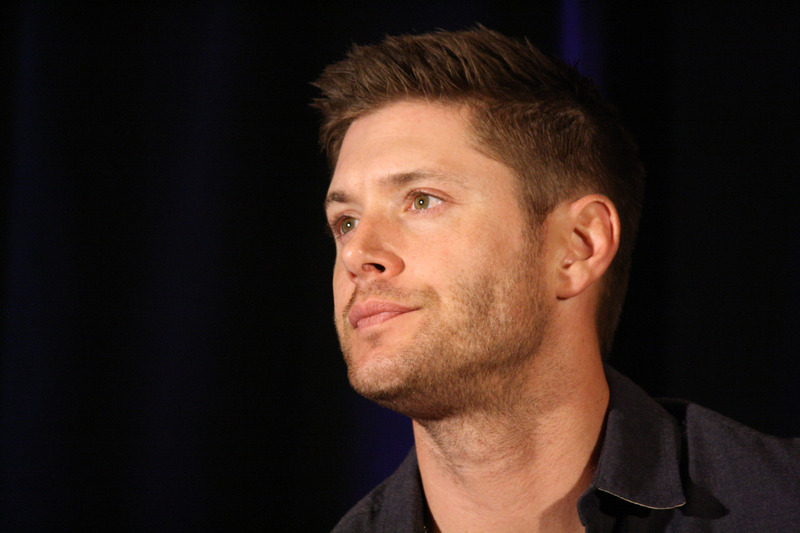 However, I’m disappointed to hear about what Jensen said during the joint panel about Demon Dean. I hope the Mark of Cain aspect of Dean’s arc continues way past that. 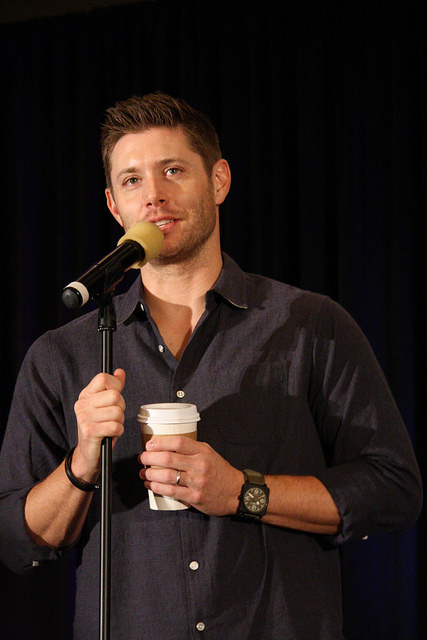 Also, can I say how much I love that Jensen is doing more singing at the cons? I love that he’s gained so much more confidence in his wonderful singing talent. I hope it continues at every con! I’m looking forward to ALL of it! And I so agree, love that having the band onstage at cons is encouraging Jensen to do alot more singing. Never too much! Thanks for sharing! Always love to get these tidbits. 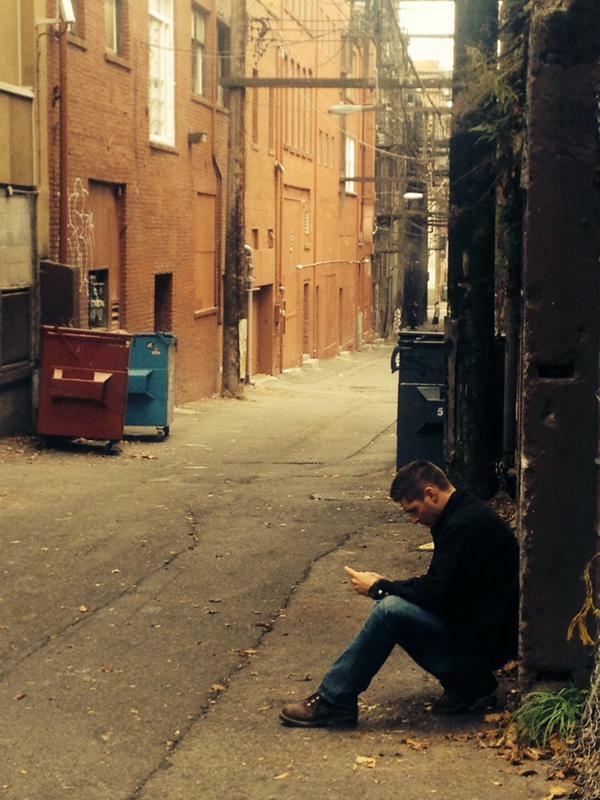 I think the part that really got to me was Jensen being depressed up in Vancouver last season. I hoped (& honestly always thought) that even though the J’s were away from their families for 9 months of the year, they at least always had each other & were kinda each other surrogate family..but it doesn’t sound like Jensen made it sound that way. 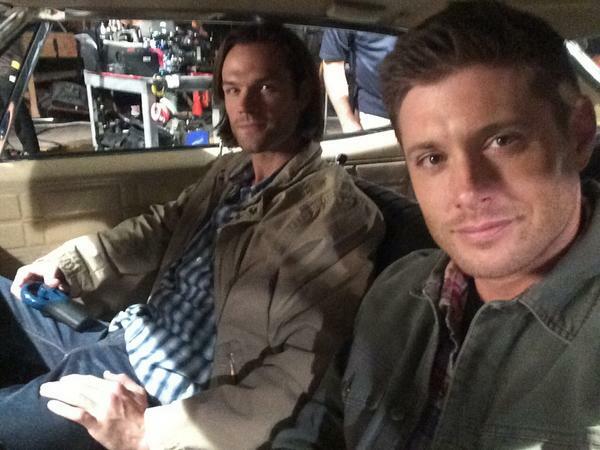 That said, glad to hear S10 is looking up for Jensen! I have so missed lighthearted Dean. I absolutely CANNOT wait for that scene between demon!Dean & Sam. I hope it’s like an entire episode length scene..the longer the better! I’m already preparing myself now to cry. 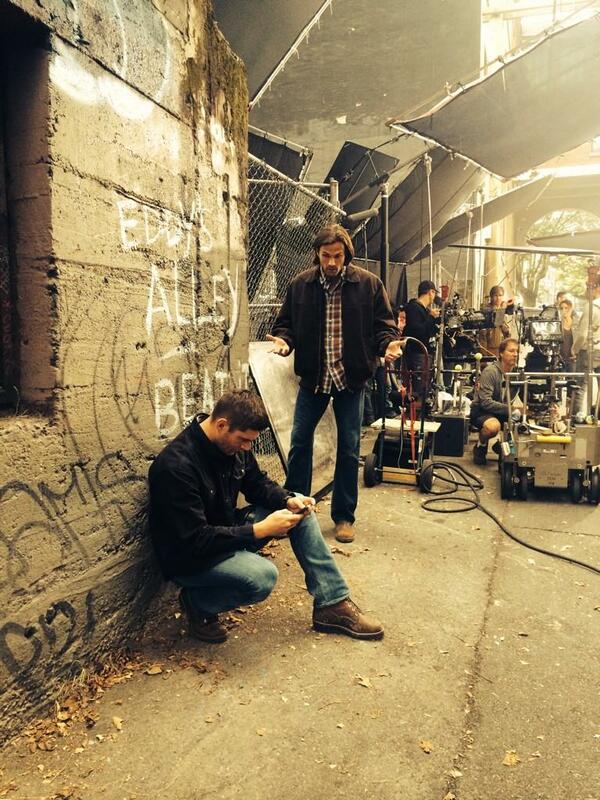 I wonder if that scene was in the episode that Jensen directed. You are more than implying Jared wasn’t there for Jensen. I didn’t see anywhere where it mentioned he asked for his help. If he didn’t share or ask for help from his wife I’m not sure he would have shared with his co-star. I hope this was not the intention of your post? As I just said above, I’m absolutely sure that Jared and Jensen are and always have been there for each other — they’ve both said as much to us, in person, multiple times. Just to be clear! I am absolutely certain that Jared and Jensen are always there for each other — they’ve both told us as much, in person, multiple times. They are absolutely like family for each other, and I’ve never met two people more supportive of each other. Nothing Jensen said implied that Jared wasn’t there for him, only that he had a tough time with that season – and he had a new baby back in LA! While I’m ecstatic that Jensen Ackles is having a blast filming sn10, I’m worried that the exciting DemonDean story arc won’t last long enough to satisfy my hunger for a DemonDeanWinchester. Thank you once again Fangasm for a good article. I always look forward to your reports. Excellent write-up! DallasCon was pretty amazing this year. 🙂 And dear lord, that picture of Misha is gorgeous. Thanks for the “memories”! I love hearing the little bits about what happens in the M&G! Wonderful pictures and thanks for sharing the snippets! 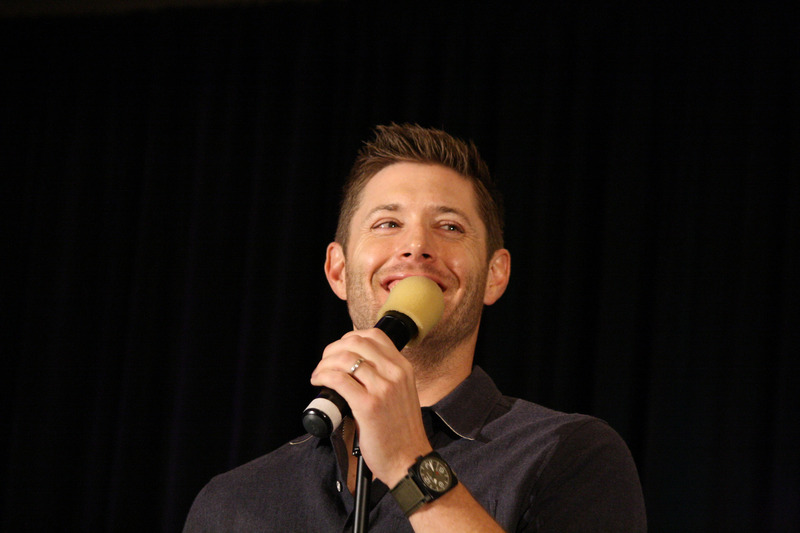 Love Jensen but adore happy Jensen. Great interview and marvellous pictures. As usual. Always looking forward to reading your reports, thank you! Funny though, how your M&G snippets always should include this curtsey to TPTB like “Creation is watching you” (awkward grin). No fear, we won’t betray you! “Jensen also talked in his meet and greet [snippets only, this is not a transcript – just my memory of a few interesting moments] about his choices in playing Demon Dean. He said he didn’t want to sort of take the easy way out and play him totally dark, so instead played him as just not caring – because really, what’s scarier than someone who just does not care? As he often does, Jensen was following the advice of Kim Manners, who clearly shaped the way Jensen acts, directs and lives his life in a profound way. Kim would say ‘give them what they expect in a way they never expected,’ and that’s what he tried to do with Demon Dean. I’m SO! looking forward to this and I love that Jensen remembers and tries to honor all that the late, great Kim Manners taught him. KM was a true and gifted artist in his line of work, IMO-as is Mr. Ackles as I’ve always believed also. Like calls to like and one knows another. Thank you so much! Can’t wait for demon Dean, Jensen will rock, he’s so talented! Thanks for this – I was in the M&G as well (my first Creation one, but my third Jensen M&G overall) and I had forgotten a lot of what was said in it, so this is great :).